This musical project promoved by the Composer & Guitar Danilo Peña de Camus counts with the participation of a number of femmale vocalists such a Susan Santos , Isabel Urzaiz, Magdalena Carrasco, Juana Martínez, Laura Amstrong o Esther López Hidalgo and also male like Miguel Garvin. Danilo has just finished the recording of a double album titled “The Last Sun – The last Moon”, with references to what has become called a new consciousness of the humanity. The Consciousness of No Time & The Absolute Space. Danilo J. Peña de Camus, Letrista y Compositor, trata estos temas en canciones como “VIOLINS IN THE SKY “, “LIVING IN A DREAM” o “LINE OF TIME “. El tiempo tiene gran protagonismo en las canciones de Danilo, así como la existencia misma. Gran parte de los temas llevan una temática existencialista. Esto se puede apreciar en canciones como “THERE ARE PEOPLE” , “FEEL THE DAY”, “BELIEVE IN YOU”, “THE NIGHT”, “ALWAYS IS TODAY”,”IN A TRICE” o ”WAITING” En otros trata temas sociales como el de las sempiternas hipotecas “MORTGAGE TILL THE GRAVE”, los abusos a la infancia “KISSES YOUR EYES”, la salud mental en la edad adulta en “THE GODMOTHER” o un sentido homenaje a las victimas del atentado del 11 de Marzo en Madrid en el año 2004: “THE DAY WHEN HEAVEN CRIED”. Otros tienen una carga mas intimista y optimista como “WHEN TEARS HAVE GONE”. En otros habla de relaciones y rupturas “BROKEN LOVERS”, “USED TO BE“, “IN AMSTERDAM”, de amores obsesivos “ HANGING AROUND”, de corte Psicoanálitico como “LONELY LOVE”, de tipo Psíquico “PARALIZYNG DREAMS”, introspectivos y metafísicos como “UNIQUE”, o de contenido espiritual como “TOMORROW LORD”o “ACROSS THE LIGHT”. 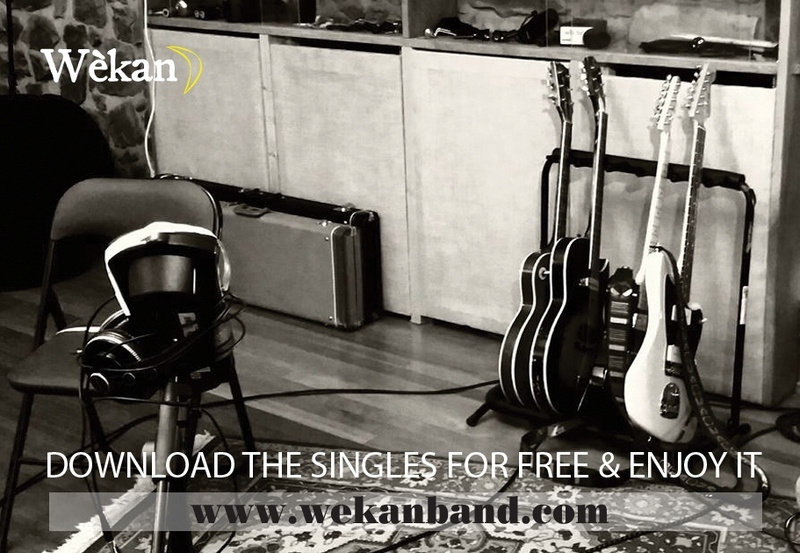 Wékan: This is the new project of Danilo J. Peña de Camus , Singer, Guitarist, Bassist and Composer. He was born and he lives in Madrid (Spain) where he studies Technical of Sound and Musical Education. After working for a while in the BMG-Ariola Studios and others as a Sound-Technician, he takes on Djing as a professional job and works in differents clubs in Madrid Capital like the Rock-Club HONKY TONK, or VANITY , ALMONTE, AMOR BRUJO, VANITY, VASARELY and others.. He had an early beginnings in the musical world and he belongs to several bands like MORBUS SACRE, ZOMBIES (Demo Polygram), SIDECAR (Indie), LOS EXTRAÑOS, CORAZONES BLINDADOS(El Fantasma del Paraiso- CFE- Zafiro), ESCANDALOS(Twins) o EL REFUGIO /Fonomusic & First Kiss Rcds; (See Facebook Profile or Download in this page his songs) with which he releases two records “El Refugio” and “Bajo el Sol” and he is able to get several awards such as the Third National Prize in the Rockdelux Magazine, the Third Prize in the Rock-Innovate “Villa de Madrid”, as well as the First position in the National Prize City of Cieza (Murcia). After his last band (with Bass Guitar Martin Techmanski, Drummer Guillermo Cora, Keyboards Jose Anadón and Vocalist Olivia Montero), called SHAKE, split up he gets in studio and recorded three songs in English language and produced by the keyboards Basilio Martí (Antonio´s Vega Musician, an extraordinary composer and singer in the Spanish scene, who sadly pass away in 2009. Interested in other fields like Science, Philosophy, Psichology and in his non-stop personal research, fighting for years against serious obsessives disorders, he achieves to Graduate in Clinical Pshicology Degree and Master of Investigation in Biofeedback and Schultz Training. His great passion for music with anglosaxon roots leads him to write this Double Album completely in English, where he tries to express his biggest concerns, giving all the songs a certain melancholy and intimate atmosphere. We hope you enjoy it. ©Wékan .